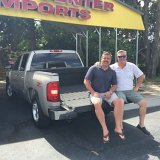 Customer Testimonial Gallery - Sport Center Imports Inc.
Got the truck I was looking for and Adam helped me get the lowest interest rate to get my payments where I wanted them!! Got the truck I was looking for and was in and out in no time! Thanks Adam! Finally got my dream car a 2005 Chevrolet Corvette thanks to Adam at Sport Center Imports!! I've know Ben for almost 35 years, thanks for your help with this AWESOME LTZ Z71 Truck...I LOVE MY NEW TRUCK !! Thanks Ben, this is absolutely the easiest car deal that I have ever experienced ! I recommend that everyone check out Sport Center Imports.